If you want another theme with an animated background, tell me in the comments! 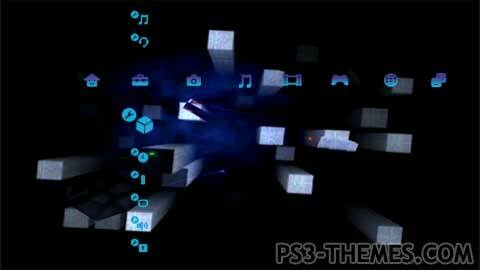 This theme was posted by PS3 Themes on March 13, 2018 at 6:04 pm, and is filed under Dynamic Themes, Gaming. Is there any way this could get an updated version with a higher resolution or less compression? some of you said thath ps3 themes dont work. but to get themes working you have to use PS3 internet browser and dowload them there i am even writing this messege from ps3 internet browser when you are done dowloading go theme settings themes and choose a theme for your PS3. whats been up? where is everyone? Hello I am the creator of this theme, my ps3 will be damaged (red lights -.-) so at the moment I can not create more themes :/ maybe in the future.. I submited a Theme of Hokuto no Ken about a week or 2 ago and it’s not up… Make sure to upload it tomorrow at least, i will submit it again today. anyone home? where are the creators? AWESOME THEME! LOVE IT! GREETINGS FROM GERMANY! Great Dynamic Theme, is it possible to make it in HD? @DOOM – Wow! What a philosophical retrospective… I agree: back in the 80s people thought that within twenty years, flying cars – for example – would have been in common use (man, I loved the Jetsons 😉 ) And what now…? these things to me are like a window, like, back in the 80’s everyone had this basic idea that everything was going to be like the jetsons in the 2000’s, now that its 2018, i think its interesting to see the little things and what direction they can go, based on what we see today compared to the predictions of the past. well ‘musk’ started the space X program, these falcon rocket shuddles that have boosters that break away and return not to fall in an ocean, but to self land on landing pads, the boosters are re-usable’ making launches cheaper to do’. space X is working with exploring MARS, retrieving data and stuff, seeing if there are possibilitys of habitation,, the whole thing with the car is kinda funny, its a marketing move while launching the research stuff he decided to launch a roadster with it’ lol. so theres a roadster orbiting mars ‘forever’ lol. making elon musk the first man in history to launch a car into space. @ADMIN: Hey, my friend! I’m really glad to see you’re still here to manage our favourite site! I did receive your email and answered it, maybe you didn’t write the correct email because it was totally different from the one you use here? well, it must be weird waking up after all this time, im glad your around man, no joke’ i told ultra i was thinking of using some resources to find out wtf happened, but we agreed that it was an invasion of privacy so i didnt, we just came to the thery that all hope was lost, whats up with the surgery? besides the coma’ is there any good news from it? @DOOM: “i thought you where gone forever” – Heeey my friend! I’m so happy to hear you again! What about you? No more themes? I’ve been away for some years, so I’m REALLY glad to see there still are guys who make themes: thank you!